Congratulations to Paula Bielnicka on winning our twenty third High Five Giveaway and thank you to all who entered! 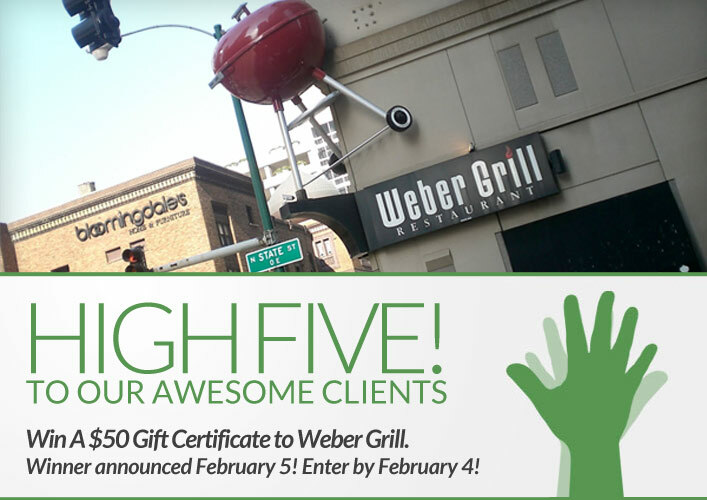 Our next High Five Giveaway is for a $50 gift certificate to Weber Grill. When is the first day of Spring?! Now, just add a comment to this post with the right answer to be eligible to win! The winner will be announced on Wednesday, February 5. Entries must be received by midnight on Tuesday, February 4. Not soon enough! It will be May 20, 2013. March 20th, 6 months after my birthday! Feels like it today! But the first day of spring is on March 20. Besides not soon enough despite today’s weather?? March 20th!! Wednesday, March 20th is the FIRST DAY OF SPRING! !